Stay:2018/3/26 mon. - 2018/4/16 mon. Founded in 2012, led by Yuri Yamada (playwright, director and actress). 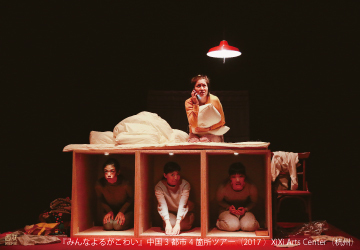 Moving freely between stage and seats, reality and parallel world, normality and craziness without any borders, Yamada illuminates the problems of Japanese modern society with her witty and pop style. In 2014, she started “uchi-project”(“uchi”means home in Japanese) where she rents a house or an apartment for a long period to create, rehearse and perform. The project becomes popular with the work where the public moves in an entire house and the three-month long-run performance in one-room apartment. 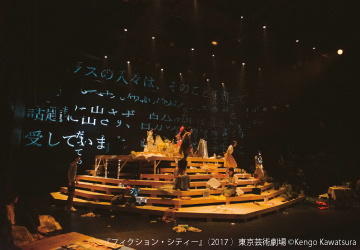 In 2017, with “Fiction City”, the company participated in the GEIGEKI eyes with the youngest director, and their China tour of “Everyone Fears the Night” in four theaters in three cities was a great success.